What a great NAIDOC week – so many thing happening in Canberra to celebrate the theme of Because of Her, We Can! Congratulations to the ACT NAIDOC Week award winners, especially Julie Tongs (Person of the Year) and Winnunga (Organisation of the Year). Very fitting with the theme to recognise all that Julie has contributed to the community and the important role that Winnunga plays. 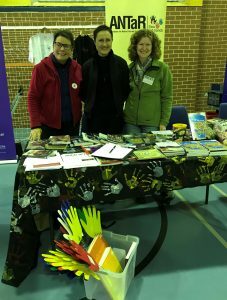 We had a great time at the NAIDOC in the North festival – thanks to everyone who visited our stall and welcome to those who signed up to this newsletter. The focus for this bulletin is to celebrate the contribution of Aboriginal and Torres Strait Islander writers – the First Nations Australia Writers Network (FNAWN) will be holding the 3rd First Nations Australia Writers Workshop in Canberra from 24-26 August 2018. ANTaR ACT is honoured to be a sponsor for the Workshop, recognising the valuable work of FNAWN in sustaining and enhancing First Nations Australia writing and storytelling. You can support FNAWN by coming to the public event during the workshop, and you can find out more about the history of FNAWN here. Join First Nations Australia authors and poets Ellen van Neerven, Charmaine Papertalk Green, Yvette Holt and Jeanine Leane who will read from their poetry on the 2018 NAIDOC theme of “Because of her we can.” Followed by a panel discussion led by Cathy Craigie featuring award winning First Nations Australia authors Kim Scott and Melissa Lucashenko and via skype from Melbourne Alexis Wright in discussion and exploration of the idea of Sovereign People – Sovereign Stories. This event is being presented as a fundraiser for FNAWN. Come on in and swap a book! For a gold-coin donation you can get a new book to read. All monies go to improving literacy in remote communities. Did you know that only 1 in 10 students living in remote communities can read, compare to 95% of non-indigenous students in metropolitan cities? This popular fun event celebrates Aboriginal and Torres Strait Islander culture and raises awareness and funds for literacy programs in remote communities. The Mapoon Aborigines were forcibly moved off their land by the Queensland government in NE Australia in 1963 to make way for mining… In helping the Mapoon people return to their homeland, Barbara Miller found her home as part of an Aboriginal family… It is a must read for those interested in ethnic studies and political science as an isolated outback community whose houses, school, health clinic, store and church were burnt to the ground rose from the ashes and rebuilt despite all the odds. It is a testimony to the Mapoon people’s strength. The convenor of our book group, Valerie, is leaving Canberra, so we will not hold the remaining meetings scheduled, but we are looking at what to do next. We thank Valerie for all her contributions while she was in Canberra and wish her the best for her move. There were quite a few interested in the book discussions, but not many could make it. Please let us know (email info@antaract.org.au) if you would like us to continue this initiative, including ideas on time and location, as well as any suggestions for books. While Paul Collis was unable to join us for our July discussion as planned, a number of ANTaR ACT members attended an event at Smiths Alternative on 18 July with readings from the participants in a workshop for emerging Aboriginal and Torres Strait Islander writers that he and Lisa Fuller had led in the previous week with the University of Canberra. It was exciting to hear from the emerging writers, and to hear Lisa read an extract from her upcoming novel, Mirrored Pieces, which won the David Unaipon Award for an Unpublished Indigenous Writer in 2017. This is the award that Paul Collis won the year before for Dancing Home. Escape the cold and immerse yourself in some relaxed vibes at the Pop Up Club with some amazing female Indigenous talent and some tasty food. The Concert features four deadly acts: Rach Armstrong, the Stiff Gins, Emily Wurramara and Thelma Plum. You will also enjoy a kupmurri – a traditional Torres Strait Islander cook up of meats and vegetables cooked underground to perfection. Gugan Gulwan invite you to join then in celebrating Aboriginal and Torres Strait Islander Children’s Day. There will be kid’s activities and entertainment. This National Science Week please join Indigenous researchers and advisors of the National Environmental Science Program at Questacon in Canberra for a conversation on Indigenous scientific knowledge and practice. Speakers will present approaches to incorporating Indigenous knowledge and values into climate science, biodiversity, threatened species recovery, urban planning, land use and freshwater and marine ecology. Be transported to a starry night in outback Central Australia through the magical combination of stories and music from the sky. This August, The Griffyn Ensemble team up with Aboriginal songwriting legend Warren H. Williams in a not-to-be-missed night during 2018 Science Week. An evergreen selection of song and brand-new Indigenous dance to match the patterns and movement of the many Australian seasons. The traditional four seasons of Spring, Summer, Autumn, and Winter have been depicted in European art and music for centuries, but the Aboriginal experience of the seasons is a much more varied and subtler story that tells of the patterns of animal and plant life and their direct impact on survival. In this sympathetic synthesis of two art forms, The Song Company is joined by a duo of dancers from The Thomas E.S. Kelly Project to trace the course of the Earth’s annual journey in movement and song, both old and new. Once a year in Tasmania, Aboriginal men and women hunt mutton birds to sell for their meat, oil and feathers. According to a Dreamtime story, these birds flew down from the moon. Their captors are known as moonbird people. The next ANTaR ACT monthly meeting will be on Monday 6 August, at 6pm, at Origin Nepal, in the Sydney Building, on Northbourne Ave – NOTE NEW VENUE, just a minute’s walk away from King O’Malleys where we used to meet. All are welcome to talk about ANTaR ACT activities and campaigning – we have had a number of key meetings over the last month, so will be reviewing our advocacy work and looking at the next steps, as well as planning our major lecture for the year. Any queries, please email info@antaract.org.au.